Artistic suicide is considered switching your game – in the middle of your game or when you’re on the top of your game. As an artist, I find it difficult to limit myself...in so many ways so in my mind, artistic suicide means not indulging in one’s personal creative callings. 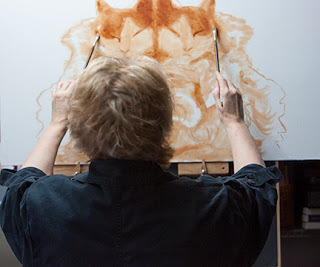 Creative process, in and of itself, means being open to things that strike the heart of the artist. I believe that is true for any creative outlet. Without that yearn to learn, I might not have attempted the above painting using only a credit card :). If one is to learn, one must take chances and to take chances one must do something beyond what is currently working or comfortable. Stretch is probably the adequate word here. If I feel content and easy at the easel (in the studio or outdoors) I pretty much figure I need to work harder and get out of my comfort zone. Another piece that took me out of my comfort zone required me to use both hands (to paint) at the same time. Yikes. (Don't worry, I still have half a brain left). I find making good art is a struggle. I don’t want to walk up to my easel every day and say, “Gosh, what a cinch, I can do this in a heartbeat.” Where’s the learning in that? I have been in this classroom long enough to know that an attitude such as that does not create fulfilling work. Predictable maybe, but not fulfilling. I LOVE to paint large. I also love to work with small studies as a way to stretch and try new approaches without committing weeks (or months) to a larger piece. Sometimes, the studies end up being better than the larger pieces that are produced from the studies. Go figure. It is a wonderful gift to be able to produce images on a blank canvas and I hope I will always reach for the struggle to improve. It has become acutely obvious to me that in this profession of fine art, one never, ever, quits learning. Even though most of us are born with the ability to see, it is only through multitudes of studies that an artist truly learns the skill of seeing what is needed in the field of fine arts. So, how does one study? It is likely you would get a different answer for every artist who is asked this question. 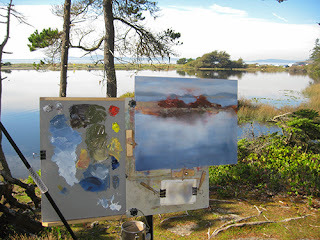 My answer is that there is no substitute for time spent at the easel; whether it be en plein aire (outdoors) or in the studio, practice is the essence of learning to see and applying that in a uniquely artistic manner. I often use small 5x7 panels so I can capture the energy and color of the moment. Also, I'm not as cautious with a smaller panel as I am with a larger one which can lead to a lot more freedom to explore. When teaching, I am often asked how one is to develop his/her style. Style, in my opinion, is not developed, it is revealed. It is revealed through hours upon hours of painting. And, not all artists have a single style. One of the ways I get time at the easel (whether inside or out) is to paint small studies that I may then use to develop larger or more complex paintings. When out in the field (en plein aire) I will often use these studies to capture true colors; colors the camera can't "see." It is a pleasure to have these small pieces to turn to for color accuracy. These small studies can often be found for a song on my eBay and/or Daily Paint Works accounts. So, off I go...study, study, study! Where does art begin? I recall a precise event that changed the way I saw the world. In my early teens I started drawing and my paper and pencils became my closest friends. Being the daughter of a Navy officer, our family moved often. And often, it was difficult to leave friends behind. Now, I had two new friends that I knew would stay with me the rest of my life. While we were stationed in Lincoln, Nebraska, I met a girl who was a few years older than me. 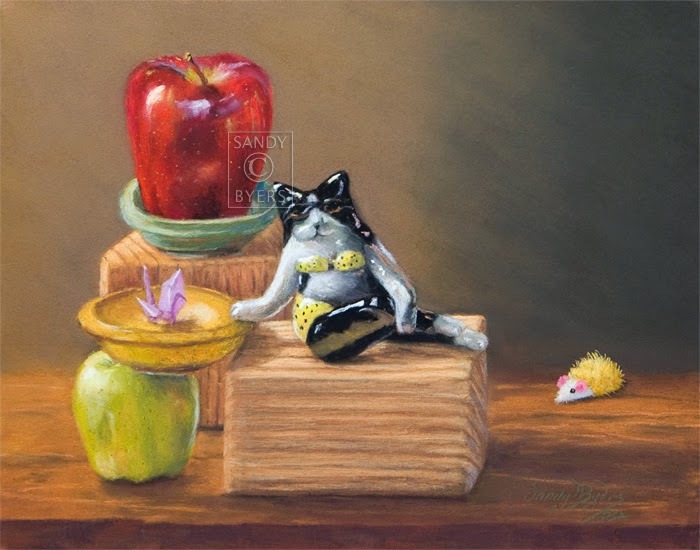 Sadly, I can’t recall her name but I do recall that she had recently started taking oil painting lessons. When she showed me her paintings I was ecstatic with the thought I might someday be able to paint, too. It did not take me long to run the two blocks home and beg with all my heart for painting lessons! My folks signed me up and the first stroke of oil paint was a miraculous thing to me. I knew, without a doubt, I had found my medium. I was in love with everything about painting; the paints, the brushes, the smell…ugh, real turpentine back then…but I still loved it. 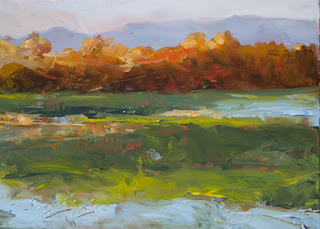 During the week, while I had to wait for the next lesson, I would sift through my tackle box full of oil paints and tools and imagine what they might help produce. My teacher was wonderful and patient. Her name was Renee Reed and I was so awe-struck by the knowledge and skill she had and shared. 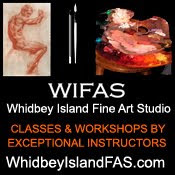 She encouraged me as I struggled with the newness of this practice of fine art. I have tried to find her via the internet but have not had success. I wonder if she has any idea how significant of a roll she played in my life? I am thankful for having the opportunity to study with her. Thank you for so much, Renee. This was the second painting I did with Renee. In her classes, we copied other artists' work to hone our technical skills. We continued moving and although I lost Renee as a teacher, I have always had the blessings of God to guide me to my next steps, in art and life :). Whether it be a person or this beautiful world He created to draw from, I am grateful beyond words for this gift. 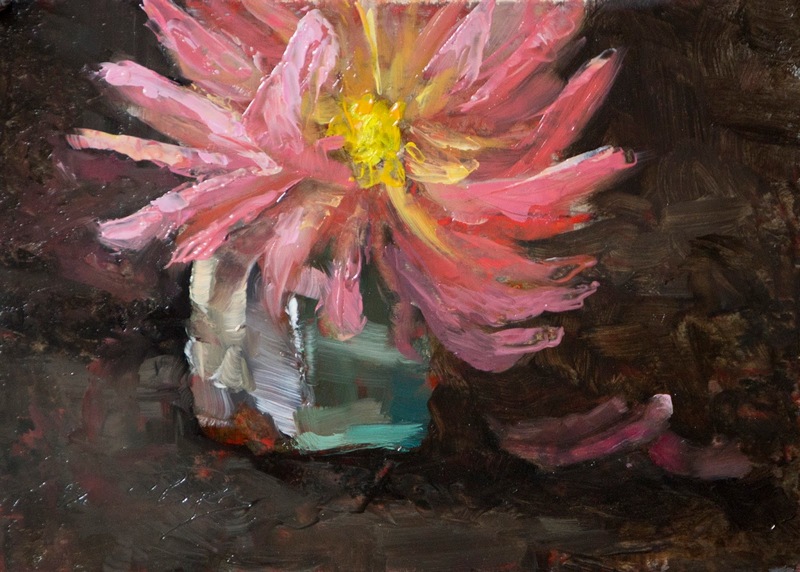 The inspiration for this piece was from an invitation from the kind folks at Patience Brewster inviting me to share in Artist Appreciation month. I thoroughly enjoyed traveling back in time to recall my first days of painting. I have been a fan of Patience’s work for many years and hope you get a chance to see some of her creative, fun, and endearing Christmas Ornaments. 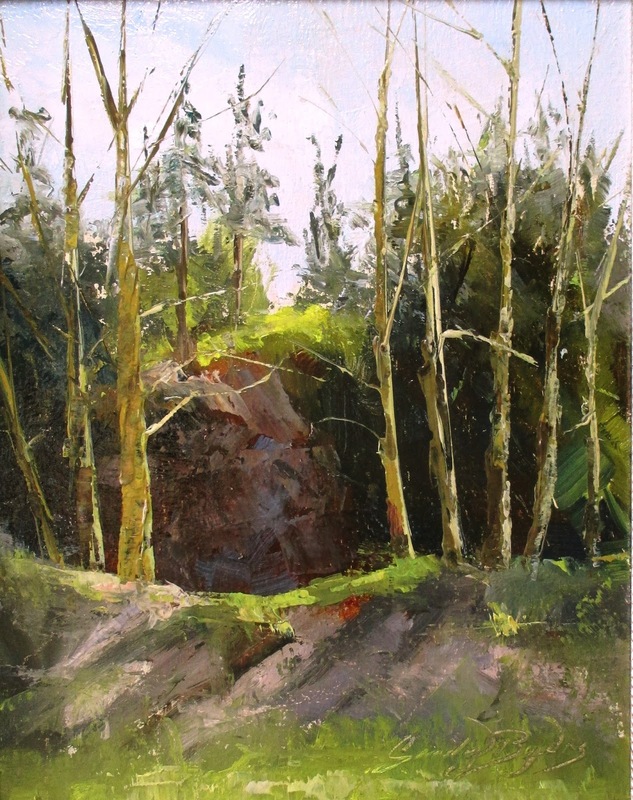 An aspect of plein air painting that I truly enjoy is the unknown. I might think I am heading out for a day of painting but more times than not, it becomes a day of adventure. 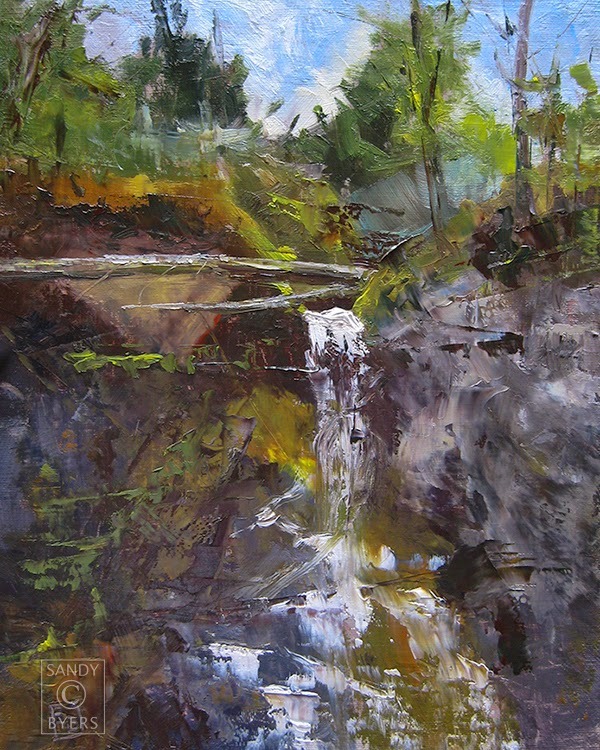 It's been a long hot summer here (in Washington) and I was reflecting on cooler days of outdoor painting. A particular event from last February stood out as a fun thing to share. 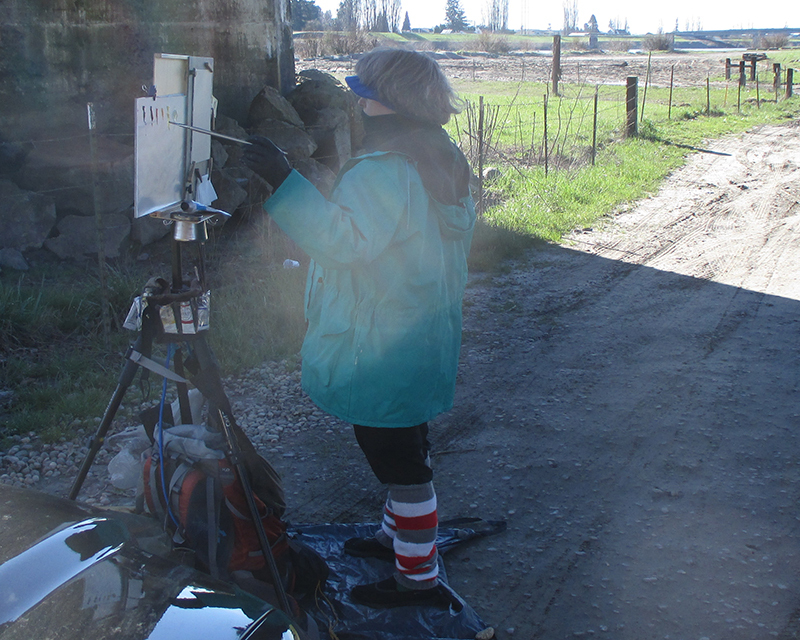 When Larry goes with me, I often go to more secluded places than I would when painting alone. In the summer this spot would be buzzing with the sound of children but, in February, it was devoid of people and it was cold! What it did offer was a lovely view of sun-stricken trees that lined the river beyond. And THAT is what made it "the" spot for the day. I layered up until I felt like the Michelin Man. Larry help me set up my gear and then I succumbed to the silence and enjoyment of painting. Normally, I enjoy folks stopping by when I paint but this day felt different. I wanted to have full attention on my painting and it was cold so I was motivated to work diligently and without interruption. Hours into the piece, and nearly finished, I heard an unfamiliar truck pull up behind our truck. Knowing Larry was there, I didn't look and I knew I could stay focused on my painting. I sensed someone behind me so I turned and a gentleman said "do you mind if I drone over you?" 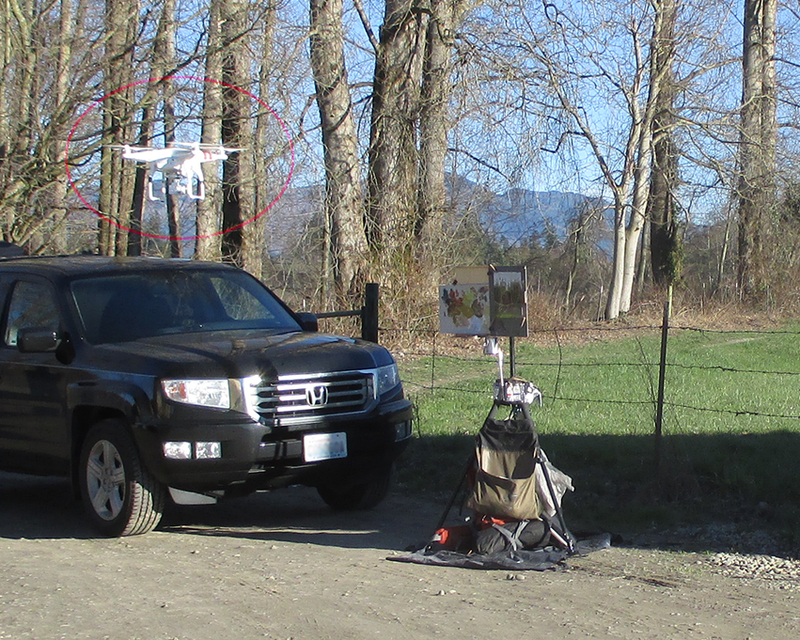 Um, I admit that, until that very day, I was not familiar with being droned. I kindly replied, "May you what?" (and I was wondering when my knight in shining armor would arrive). That thought produced my husband out of thin air. The two of them started chatting and Larry had all kinds of questions about the drone. Pat (the gentleman) was very gracious with his answers and then explained he would like to navigate his drone over me while I painted. 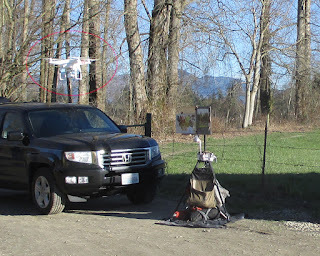 This is not the strangest of adventures so once I knew more about drones; I did not hesitate to say "sure!" Pat sent his drone over me and then posted it on his website where he has lots of wonderful videos and images. These are the photos he posted of me painting: "River's Edge." I summed it up as another great adventure in the Pacific Northwest. I must say, it took me a while to defrost but I'm ready to head out again. This time I will need my sunscreen. So how does one fit ants, a peacock and a snake all in to one story? Well, if you happen to be a plein air painter, this is fairly easy to do. 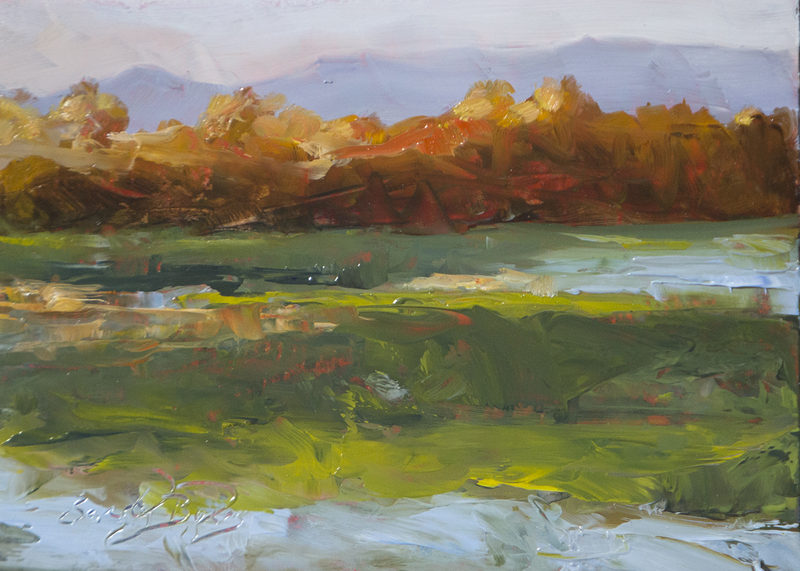 Heading off to Skagit Valley (WA) to paint for the day is always a treat. 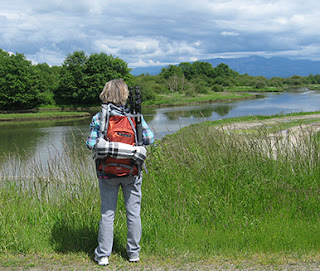 The valley is lush, fertile land and filled with wildlife; from miniature donkeys to graceful Trumpeter swans. Truly, the possibilities for an artist can be overwhelming. My internal compass usually lands me pretty close to water and this day was no different. I wandered the back roads until I came upon an inviting slough. One of the challenges was getting set up securely. The speed limit on the road is 50 so it seemed a good idea to set up on the "other" side of the guardrail. The downside of that decision is that it meant I would be standing on an incline on a fairly steep slope but I saw no other option. I generally toss down a small drop-cloth in case I drop things, or sometimes just to keep the crud and bugs off my feet. 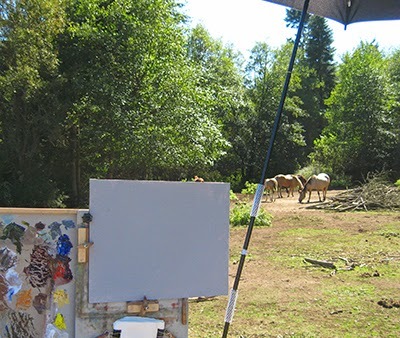 I decided not to do that this day; the slope was too steep so I opted not to use the drop-cloth but instead got to work setting up my easel. All set! I was ready for my first stroke of paint when I realized my feet were on fire!! I looked down and both my feet were covered with ants! I quickly moved, apologized for stepping on their house and got re situated. 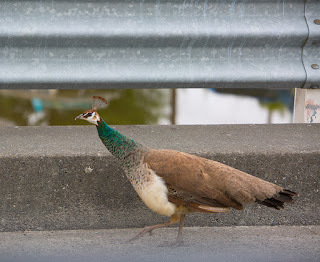 Yep, you guessed it; here comes the peacock, wandering down the side of the road. Seriously? I just didn't expect that. After the distractions, I got some work done and made quick of packing up my gear. It was hot and I was ready to seek some shade. All loaded, I took that one giant step over the guardrail, and was within inches of stepping on a snake! So there's how you fit an ant, a peacock and snake into a story without telling a bar-room joke. It feels special (and no doubt my head is already expanding) to be asked by Brackenwood Gallery to be the star of a Salon Day at their lovely gallery in the quaint little town of Langley, WA. Throughout the day, I will paint demos in both oils and pastels. Toward the end of the day, there will be a quick change and the gallery will put out yummy nibbles and, of course, fine wines. They always do things right there :). Should you be able to attend, we will have an opportunity to chat about art and the ways of life. In the fashion of a "studio," we will be offering framed pieces, unframed pieces, studies and sketches. This show is the essence of my love for the sea. I hope you will be able to join us. 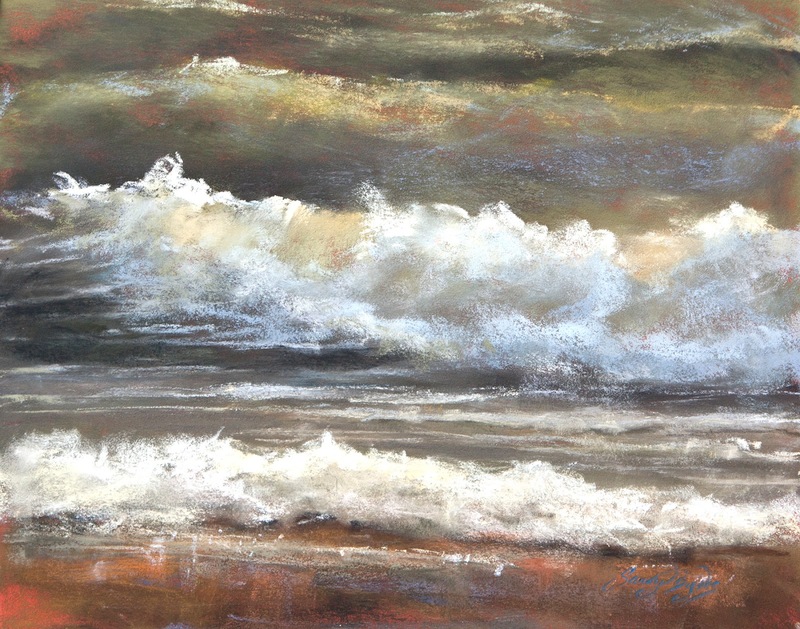 The event information can be found on Brackenwood Gallery's Website. I love it when the title "works" with the piece and admit I sometimes wonder why artists choose the names they do for paintings. Some are obvious; others, we will never understand. Realizing the title to this may be a little obscure; I thought I'd share the meaning behind it. I love (did I say love?) 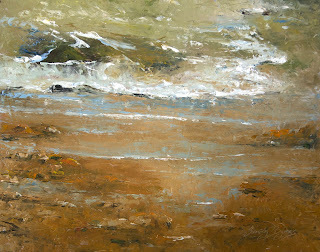 LOVE plein air (outdoor) painting and suspect I have as many stories about those adventures as I do paintbrushes. This one is no exception. A friend and I were just setting up our gear on the beach when a couple of young boys ran over to see what we were doing. I am pretty good at guessing what entertains ten year old boys. If I were a gambling girl, I would have lost a big bet on those two. Those boys quietly entertained themselves looking at rocks and turning over seaweed for more than two hours just so they could see our paintings! Wow, well blow me over. I just smiled out loud about that for days. Hence, the name. 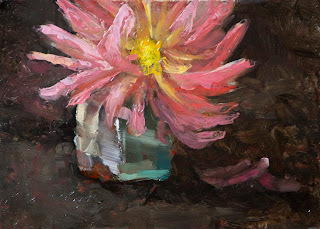 Still life paintings need to mean something to me on a very personal level for me to enjoy the process of painting them. This one does. Each piece in this painting represents aspects I think are important in creating a happy and healthy life; Learning, Honoring, Creating and Playing. It seemed only logical to start with the strong foundation that is required before beginning to build anything. With that in place I added the apple to represent our early stages of learning. Next, I placed the lifebowls and it is significant to me that I chose bowls gifted to me by a dear friend to represent the lifebowls. I especially enjoy that they are handmade and not perfectly symmetrical because whose life is? Balancing one’s lifebowls can be a bit tricky at times. Mine seemed to stabilized quite nicely once I placed the origami crane smack in the middle of it because, after all, where would we be without honor and loyalty (the traditional meaning of the origami crane)? With a good foundation (be it family or religion or both), learning underway and loyal friends, creativity has a chance to thrive. Enter the kitty. Having created her from clay (after my own lovely cat), she seemed perfect to represent my idea of creativity for this little play. And, she had the added benefit of exuding relaxation/vacation which I know is part of a good balance in life. The mouse is probably quite obvious but after watching my cat for years, I know how important playtime is! All of this is topped off with a huge, red, apple juicy enough to bite into and it is intended to represent our blessed learning that continues year after year that is so absolutely delicious. 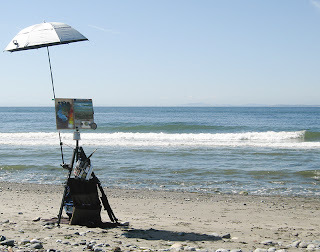 Last year I was invited to attend an inaugural plein air event on the Olympic Peninsula (in Washington State). 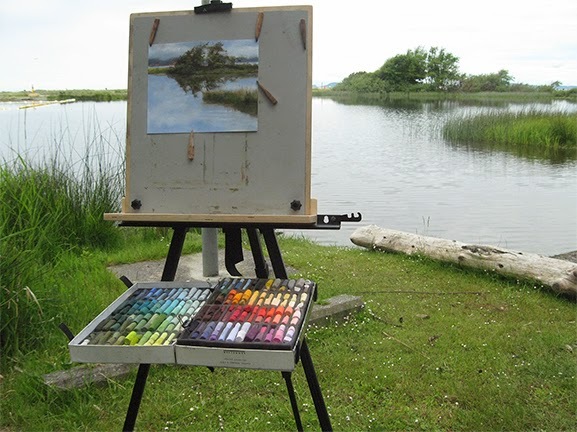 The event is headquartered in Port Angeles, Washington, and is known as "Paint the Peninsula." Since I had recently fallen in love with plein air painting, and anything associated with it, I jumped at the opportunity. If you have attended such events, you likely know that the back of the substrates you plan to use during the competition are stamped before painters head out in all directions. This assures that all paintings are, in fact, done within the confines of the event. I got my substrates stamped and headed out to see the world. My ever-loving husband, Larry, accompanied me for the event and was always willing to be my sherpa (not to be confused with a shar pei :). 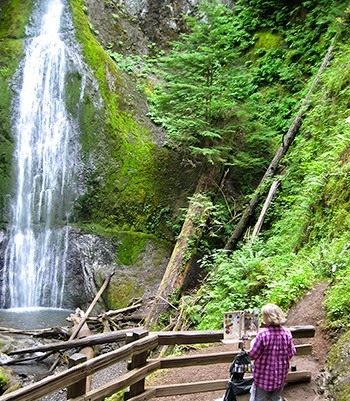 I don't recall which day it was when we decided to hike in to Marymere Falls. It's not a long hike; just under a mile from the trailhead but Larry was nice enough to carry my gear for me. When we got to the falls, I unpacked my stuff and realized I had forgotten my stamped panels. 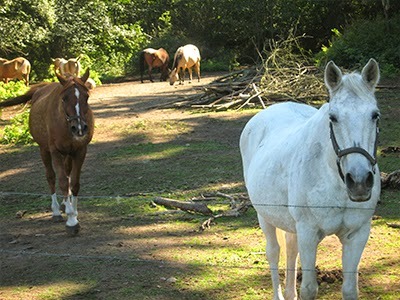 Larry, as always, came to my rescue and hoofed it back to the trailhead to get them for me. Now, he had three miles under foot as he returned. I had my panels. Yay! I could paint. I went to retrieve my painting tools and, believe it or not (I am typically a very organized person) I didn't have my painting tools either!! I was not about to ask Larry to go another two miles because of my mistake. After a few minutes, I thought to pull out my credit card and started painting with that. I rather liked what was happening so I continued until I felt the piece was done. I wiped off my credit card, later hung the piece for the event, and was shocked, thankful and amazed when it won a special "Juror's Award!" 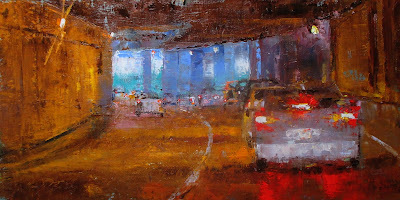 Since then I have done quite a few more paintings using my credit cards (swiping took on a whole new meaning for me). 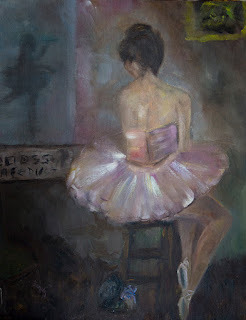 One of the great joys of painting is the connection between my subject matter and my heart. 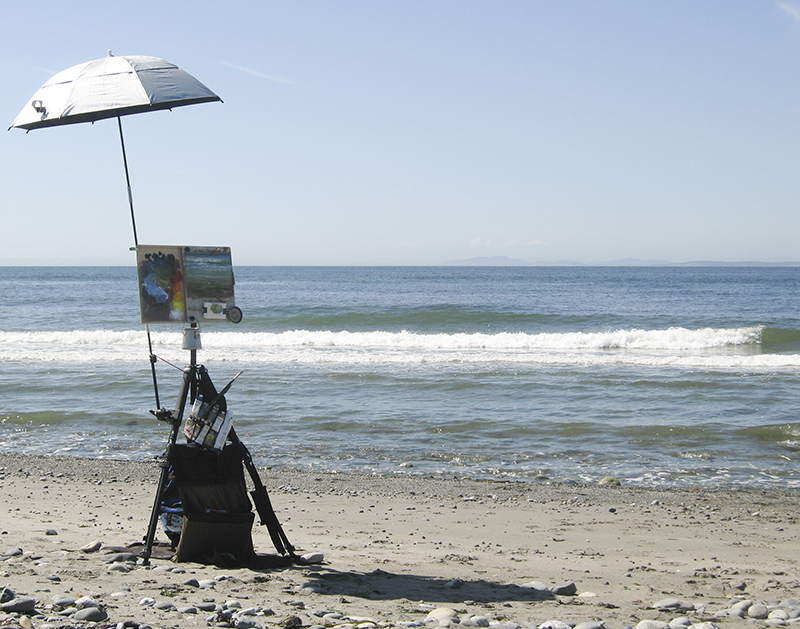 Plein air (outdoor) painting is one of the ways I eliminate interference when applying art to my canvas. 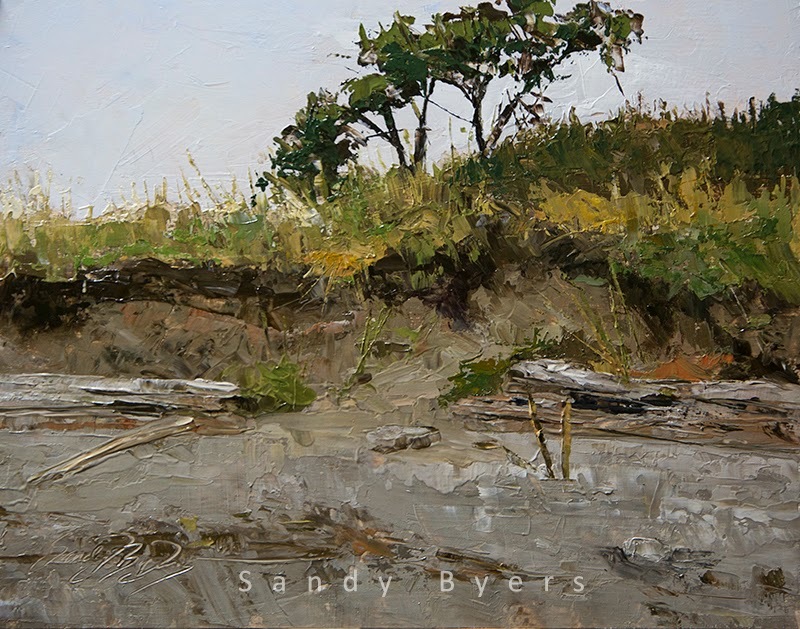 On this particular adventure, I was on my way to the west side of Whidbey Island because there are a few beaches there where I love to paint. 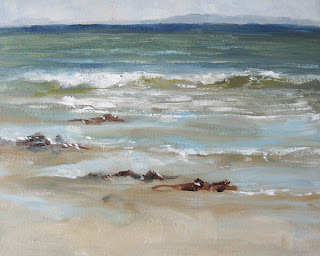 On the way, I thought about which beach I would land on and how I might portray the scene that is so familiar to me. Driving across the island, I took a shortcut through a housing complex that quickly turns into rural area. 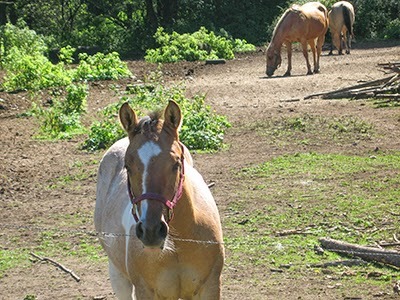 Just past the houses, I happened to look to my left and my heart jumped to my throat when I spotted a small family of horses drenched in the only sunlight within a mile of where I was! I made a u-turn in the middle of the road and had my painting gear set up within minutes. My connection with animals is a gift I treasure beyond words. 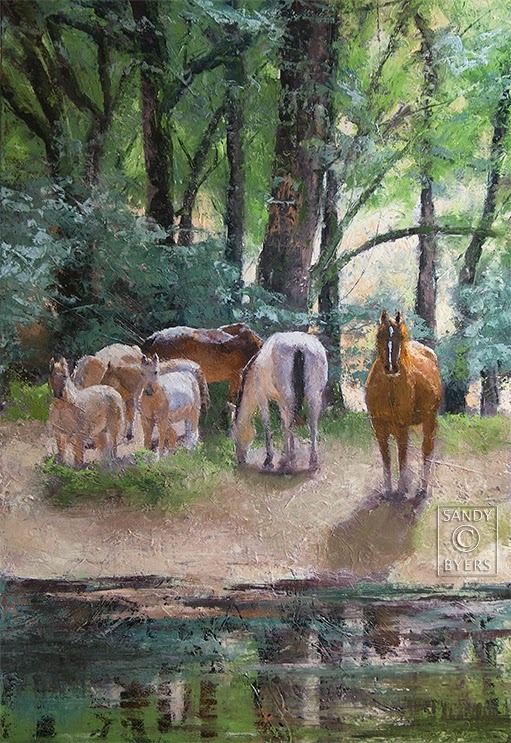 Throughout the course of my painting stay, I was visited by each horse in what seemed an organized progression. Each came close enough to see what I was working on, and then gave up its turn for the next one. I felt so privileged. The painting at the top of the page, Forest Gypsies, is a result of embracing serendipity. Ah, yes, back to Deception Pass. 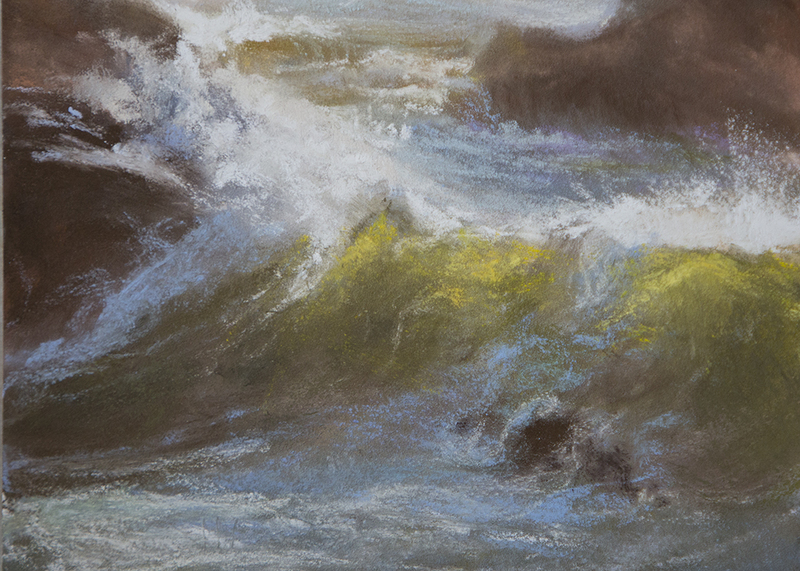 This time with pastels and a slightly different angle. I love this park! It's no wonder there are over 2 million visitors annually. Let's not even count the number of people who then fall in love with Washington. 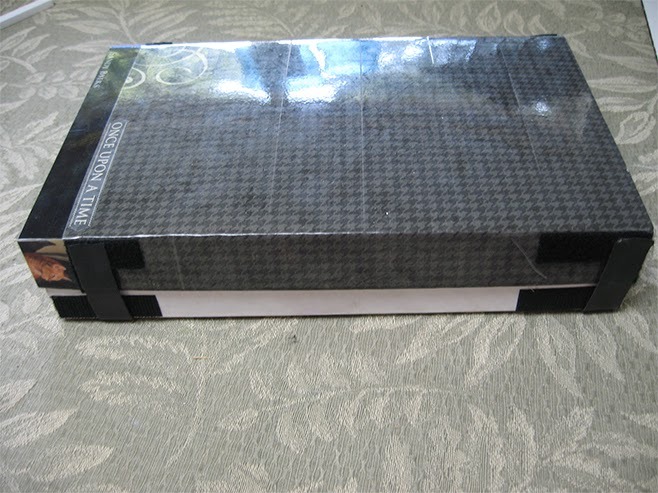 I thought I would show you the box I made to carry in my backpack for plein air painting. I wanted something super-light and just the right size to fit in my pack. I found that one of my (saved) Sennelier Pastel boxes worked wonderfully for this project. 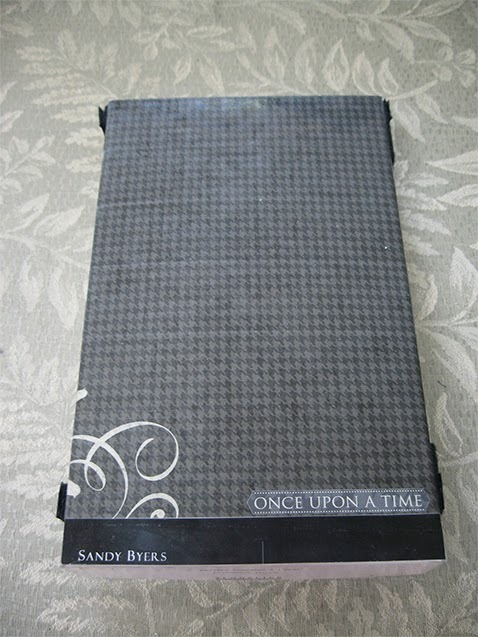 I covered it in scrapbook paper (and couldn't resist some stickers).and then covered the entire top with clear packing tape to give it a little extra protection. Then I added a few strips of velcro so I could a) velcro the box closed and b) velcro the two halves of the box together to place on my easel butler. So far, this is working out really well. I'm not sure how long the box will last since it is made out of cardboard but so far, so good. It's almost time for me to head outdoors to paint and I am more than happy to do some more testing. I am proud to say my father served in the Navy for over forty years (thanks, Dad!) and by way of his service, I was a Navy "brat" (probably in more ways than one). On average, I think we moved about every 18 months. I have lived abroad, lived in more states than I can recall, and have traveled through all of them at one point or another in my lifetime. Out of all those places, I feel very blessed to call Whidbey Island, Washington, my home (and to have my parents living right next door and my siblings within spitting distance). Perhaps I have been a bit swayed by the remarkable Summer we had this year. And, now, a beautiful Fall. I doubt I am celebrating all by myself but I AM celebrating! 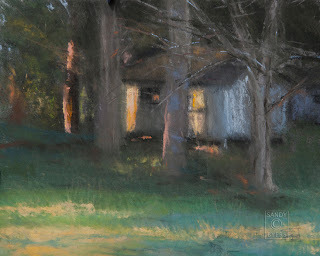 I am taking every opportunity to be outside and enjoy these glorious days and practice my plein air painting. Ah, what a LIFE! The painting above is from a day at Deception Pass Park; a most glorious park. A short little hike and, presto; a little piece of heaven. Sun, paint, lunch, paint, sun, paint, sunset. 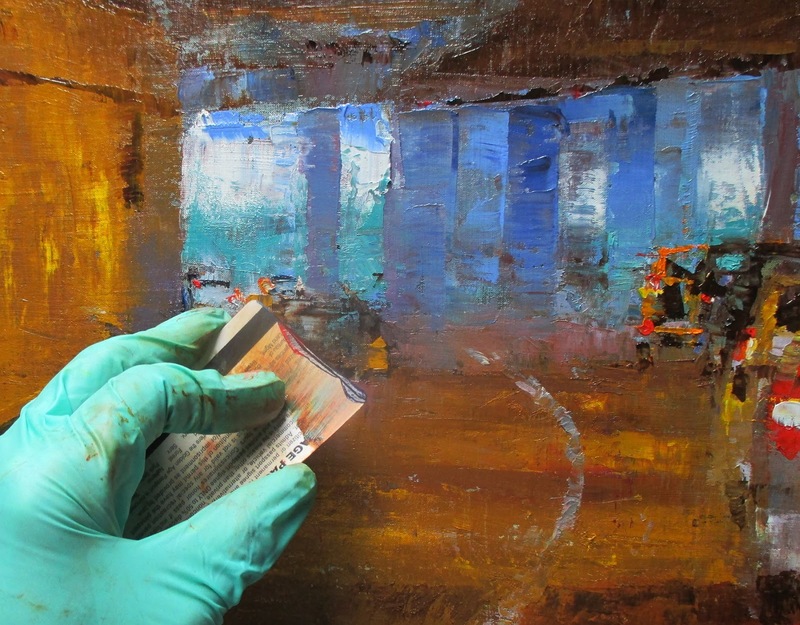 How many surfaces can an artist be in love with at any given moment? Um, I don't really have the answer to that question but I am adding one more to my list. After reading a recent article in the Pastel Journal about Multimedia Artboards for Pastels, I ordered some. Oh, my! I am love-crazed, yet again. I have every intention of trying this for oils, too. I just haven't gotten there, yet. The study above is part of the work I am doing for a larger oil painting so it was a perfect opportunity to try the new surface. The pastel went on nicely and stayed where I put it. 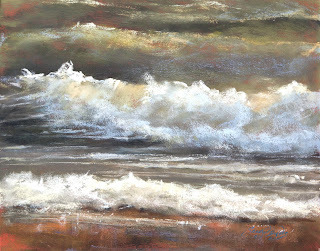 I also enjoyed that the surface takes multiple layers very well without mooshing (yes, that is a word in pastel-speak) the layers below. Where does a girl go for the entire summer, you ask? "Why, outside, of course." 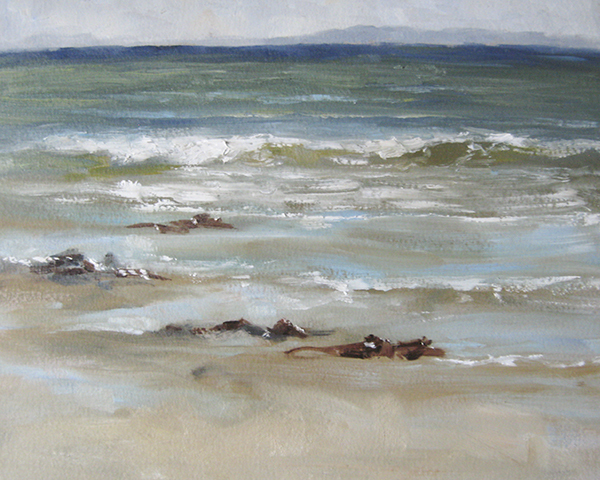 Yes, yes, I have been back plein air painting and off on some wild adventures. So many that I have barely been on the computer; it's all I can do to stay in the house. One of my favorite spots is on the west side of Whidbey Island (Washington). 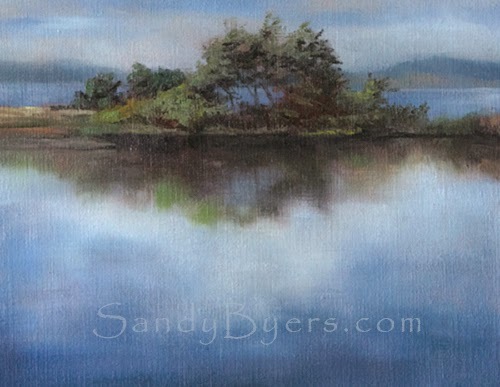 There is something so serene about painting the water while listening to the waves rolling onto the shore in the background. Last time I mentioned my set up, it was larger. I'm now working so everything fits in my backpack and I've chosen a standard size of 8x10. It makes it easier for me to plan things that way. I may switch out to a 9x12 later but for now I am enjoying this small size.